An intensely and intimately evocative rendition of the tragedy about the ultimate narcissist. Richard (Steven Barkhimer) will do anything to get power. He ingratiates himself to rivals, manipulates up the wazoo, marries anyone – even widows of those he has murdered – and does it all with impunity. There is not a shred of conscience in the guy’s soul, but somehow he’s very effective at getting what he wants. Shakespeare allows the villain at least that much, though, in the Bard’s moral universe that will never be all there is. 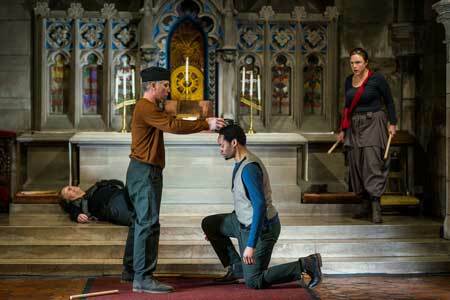 This production of the unsettlingly timely history play is offered in the intimate and very Gothic Swedenborg Chapel, located near Memorial Hall on the edge of the Harvard campus, and it turns out to be a great setting for it. 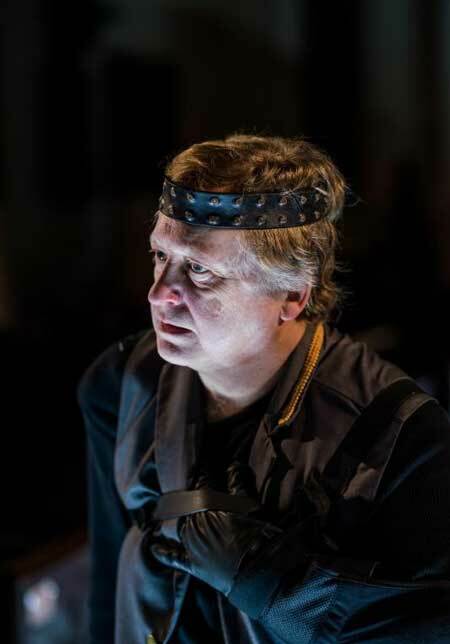 All of the actors, besides Steven Barkhimer who plays Richard, take on multiple roles, filling the aisles and the forward spaces of the chapel with kinetic flair and enriching the entire nave with activity and drama. The final battle is choreographed with the actors doing a kind of suspended English dance with clapping sticks, very effectively. And many of the soliloquies are rolled out along the main aisle as the actors peer into the faces of audience members. As Richard, Steven Barkhimer, known especially for his comedic flair but also adept as a dramatic actor, is superb. He gives the role a kind of histrionic dimension that seems so important to its portrayal of a pathetic clown turned into a vituperative autocrat. In order to assure that Richard is seen as almost self-parodying as well as demonic, having a good degree of humor and satire built into the portrayal is very useful. While doing so, Barkhimer manages to convey a sense of animated malevolence which is perfect for the role. And the awful words, both the pandering ones and the evocations of betrayal, slide off Barkhimer’s tongue like flaming butter. Particularly noteworthy in their varieties of roles are Paula Plum (who played opposite Steven Barkhimer in the Lyric Stage’s memorable production of Who’s Afraid of Virginia Woolf? last year) and Deaon Griffin-Pressley. Griffin-Pressley emerges most eloquently and notably as Richmond, savior of the day and slayer of Richard, offering the declaration of battle with energy and conviction. The entire cast is excellent, with Michael Forden Walker shifting gears as Clarence, Richard’s ill-fated and unsuspecting brother, and then as Buckingham, who panders to Richard and then finally abandons him. Mara Sidmore takes various turns, as the widow who Richard unbelievably seduces into marriage (given that he killed her husband), and others. Jennie Israel does well in everything from King Edward to Margaret. The production is, as director Walsh notes in the program, somewhat stripped down, with a number of scenes extracted. The result is a trim and focused production which, under Walsh’s astute and seasoned guidance, gets its point across mightily. As it is, the plot is complex and there’s plenty to handle without the additional scenes. Fortunately, the program offers a nice schematic of the dramatis personae so that one knows who has already been killed before the play starts and who is going to be killed during it.